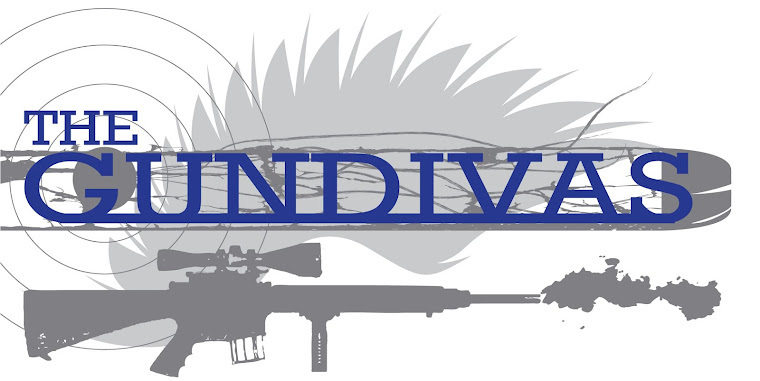 The GunDivas: SHOT Show give-aways! I can't even begin to remember my first gun experience since my dad was a huge gun fan. I don't even remember learning to shoot, I was that young. I married a huge gun fan too. I'd have to say the best firearm experience I had was in the Marine Corps where I got to fire everything - including M1911A1, SAW (squad automatic weapon),M203 grenade launcher, M60 machine gun, M2 .50 cal machine gun, all sizes of mortars, called in artillery and air power. I enjoyed EVERY experience. My hubby, sister and brother-in-law still enjoy visiting the range we're members of. Skeeter is my former self in a lot of ways. My earliest gun memory is that of my psychotic grandfather "teaching" me to shoot using a 12 gauge shotgun when I was very young. I don't remember exactly how old I was but, I was definitely younger than 10. Probably even less than 7. He nailed the cardboard container for a case of Buckhorn beer (which conveniently had a target printed on the bottom) to a stump, had me assume the prone position behind the shotgun and said "pull the trigger". I'm fairly certain the recoil lifted me up off the ground, and I barely hit the corner of the "target". This from the same man who sent me squirrel hunting with a 20 gauge shotgun and instructions to "aim for the head". Despite all that, I've been addicted to guns ever since. So, I suppose you could consider it a positive experience. I did eventually learn proper shooting technique in the Boy Scouts however. The advice I give to new shooters is the same I wish I had been given. Start with .22 pistol/rifle to learn proper technique, never be afraid to ask a question (it's the only way you'll learn) and rent/borrow bigger guns from there to see what you like and that fits your hand before spending money. Color me jealous, JMSH. I'd love to play with all the big toys you got to play with. K - I'd love to see video of your first shot! Seems like all boys go through that 12 ga rite of passage. I used to dream of wearing a holster with a peacemaker in it as a kid....weird for a girl! We did not have guns when I grew up my my gramps and uncles did and went hunting...that is where the dream started. I had a shotgun when I was living alone as a young professional, but never used it. I sold it when I married. I went to my first gun class at our National Guard Armory in the fall of 1989. It was an all women's class and I went with 2 girlfriends, and we all loved it! It made you feel like you could actually learn and being in a controlled enviroment made me feel safe in learning. My husband set me up with a great gun before class and I learned if you had a bad gun you were a bad shot (one of the girls had a dorkie 20 gauge pistol you couldn't hit the broad side of a barn with, so she became frustrated and did not finish class. I now have a licence to carry and I am glad I do. It has been a positive experience and I plan to continue target practice, it is a fun sport as long as everyone is safe. My first gun memory was when I was 8. I don't remember much, except my dad bought me a .22 rifle, which I still have, and took me to the hay stack to practice. It knocked me over. Yes. I'm a clutz. Actually, it scared me and I fell down backwards. Dad got me back up and we continued to practice from then on out. He taught me a lot about firearms safety, made me take a safety course, and worked with me on the ranch. Later, he bought me bigger and faster guns, although I still love a .22 anything. Fun guns for prairie dogs. Later, as a 14 year old, I would use that same .22 to shoot off the hood of his 77 Ford pickup to kill gophers in the field. Yes, I did shoot a hole in the hood. Dang it. I thought I was in trouble, but dad took it pretty well. We respected guns because of Dad. That is the best advice I can give. Teach, respect, safety. I did the same thing with my daughter and she never falls off the safety wagon. I am very proud of her. I only wished I had had more guns and more shooting time. Practice and familiarity is everything. I still have the little Chipmunk 22 rifle that I learned to shoot 50 (yikes!!) years ago. All of us kids learned to shoot as youngsters and the house was full of all sorts of rifles and pistols. We raised a couple of pigs every year for the freezer. One of my jobs was to control the rat population in the barn. One day we got the bright idea to shoot the rats with my uncle's revolver. I don't remember much about the whole experience except that every time I pulled the trigger flames shot out the side and it bucked like a son of a gun. Best advice I ever got - Just go shoot! (Kinda like the horse thing.) Advice I'd give - ask if you don't know. OK I have to think a little bit about what my first gun experience was. It has to be the old lever action BB gun of my Dads. My sister and I would sit for hours on the deck and shoot cans off of the old hitching post, which was about 10 feet long, so we could set up a lot of cans!!! That is how our Dad first taught us to shoot. What drove me to learn to really shoot. Marrying my husband! My Dad has alway been an avid hunter, but for some reason he never took us girls. When I married my husband I really went crazy!! We hunted a lot, the first time we put in for cow tags we drew partner tags and both got our Elk!!! Fun memories are those!!! He bought me a .22 auto pistol one year, I traded it in on a .45! LOL He has his guns, and now I have mine too!!! Advice for new gun owners, get educated, take the Gun Safety class, take a pistol class. Be comfortable with what you shoot! Because I never liked guns until I started reading Tara's books, my first experience in shooting a gun was with a 9mm my nephew showed me how to use a couple of years ago. My grown daughter and I were shooting at the same target, so of course both of us thought the body shots were ours. LOL Ever since then, I have bugging a friend of mine to take me to the gun range. He is a volunteer policeman and is well qualified to teach me. So, fingers crossed, it will happen soon. Colleen B - That's so cool that reading Tara's books inspired you to learn to shoot. I forwarded your comment on to Tara; I know it's going to thrill her to death. The Q&A with Tara just went up, so be sure to check back and leave a comment to be entered to win an autographed copy of her book. My first gun memory is of course hunting with my Dad. Even when I was tiny he would take us hunting with him, talk us through everything he was doing from spotting game to wrapping it up and putting in the freezer. As intended guns were second nature to us kids growing up. We first learned to shoot with air pump BB guns. Which may sound silly. like playing with toys, but it was serious stuff at my house. Our Dad was demanding of our knowledge of the gun, the way we handled the gun and our marksmanship. From there we graduated to the ever reliable bolt action .22 rifle and from there to other various hunting rifles and shotguns and then eventually handguns. The advice I would give first time shooters was given to me, but it took a couple of years to really get it. People would say "relax" or "exhale" just before you shoot but what they are trying to get you to do is not to tense up and anticipate the kick, which wrecks your aim. You just sorta have to train yourself not to do that. I would also add to newbies - that it is possible to over practice and if you do start bracing for a kick, the more you over practice the worse that will get. I love your books, and hope to win this new one! I have always had guns in my life, as my Dad(s) were police officers. My step mom was a police officer, my husbands Dad was a police officer, a Criminology Professor at Cal State and a Private Eye. My husband is now a Rangemaster and a Private Pistol instructor. I am too, as well as an HSC Instructor and I do the California paperwork for a few gunstores in this area. My first gun was a Red Rider bb- which was taken away because my brother shot my toe. Earliest memory is my Dad showing me his service revolver, showing me how to load and unload it and where he kept it. Then he pointed to his belt and said " If you ever touch it without permission, I'll whup ya good." He never had to. My favorite gun is a .22 Ruger Vaquero, nickel or a .357 Ruger Vaquero. My second favorite is a ..38 Colt Detective special. Best advice- They( guns) are always loaded. Never forget it. Cue the second (good) husband, years later. I was trail riding alone in Memphis a lot, and I thought maybe it'd be a good idea, and when I broached the subject he just told me to get properly trained and go for it. This sounds really gruesome to a lot of people, but the main reason I learned to shoot was in case my horse mortally injured himself miles from a vet. It'll give me a fighting chance vs. a crazed serial killer too, but honestly, I'd fight with or without a gun. My advice would be to get a heavy pistol. I tried out some compacts and subcompacts at the range where I learned to shoot, and in my caliber (.40) bigger is definitely better. You can conceal a full size pistol almost as easily as a subcompact, and you're better off shooting something you're not flinching away from. Also don't get a .22 for your main carry piece. You're just going to piss off whatever you shoot with that. I got into shooting when I married my hubby. We liked to target practice in the gravel pit near our home. I usually used a 22 as I don't like anything that has too much of a kick. (I know, what a wimp) We have lots of guns in the house, all locked up in a gun safe, and some antique ones that are on the wall. Now my eyesight is not great and I wear trifocals which makes accurate shooting challenging. I can't give any advice as I am not that good at it myself but enjoy an afternoon playing. Oh, I do have some advice, wear good ear protection!!!! The first time I shot a gun was about 2004, I think. I bought my ex a 22250 for his birthday. We were out at the ranch and he was sighting it in, whatever that means! He asked if I wanted to try it. I said sure. He pointed out a place on that dirt pile that he'd been shooting at, and told me to get as close as I could to that spot he'd picked out. My DH is a Texas Peace Officer, and is wanting me to get my CHL...I'm still on the fence about it though. My Dad didn't start hunting til I was a little older. So I was about 15 when I started going to the local gun club with him to watch him shoot trap. The first time he let me take a shot it about knocked me on my keister. Stayed away from guns for while until he introduced me to hand guns my junior year. My interest in guns of course started because it was a way to hang out with my dad. Then I married a hunter and the rest is history. The best advice I can give is get proper instruction from someone who knows what they are doing. Cleaning, safety, actual shooting...everything!